When I think of being prepared, my thoughts immediately go to the kitchen. Before me are cupboards, drawers, pantry, and a refrigerator loaded with: pots, pans, cutlery, appliances, seasonings, dehydrated foods, homemade canned foods, and foods that have been bought in bulk (such a rice and flour). There is also a freezer in residence that aids in our meal prepping as well. 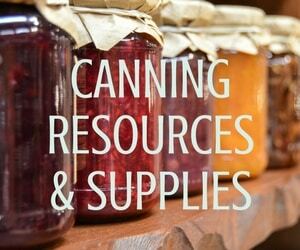 I know where everything is and exactly what I have on hand. But as I search through various cupboards, freezer, and refrigerator, I notice that what I always have on hand are the ingredients to whip up a really good homemade chicken soup. For me, not only it is comfort food, but it is also something I make when anyone in our home catches a cold or feels under the weather. 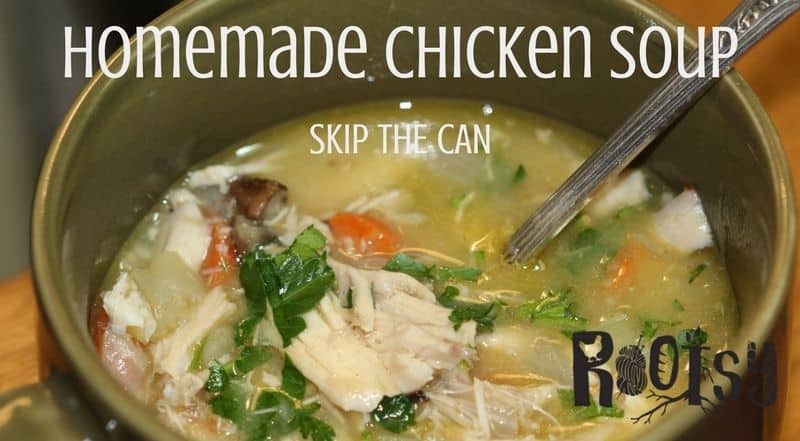 As a child who grew up on chicken soup that came from the telltale red and white can, I discovered pure bliss as an adult when I decided to forgo the can and make it myself. Little did I know what bliss I was about to unleash! 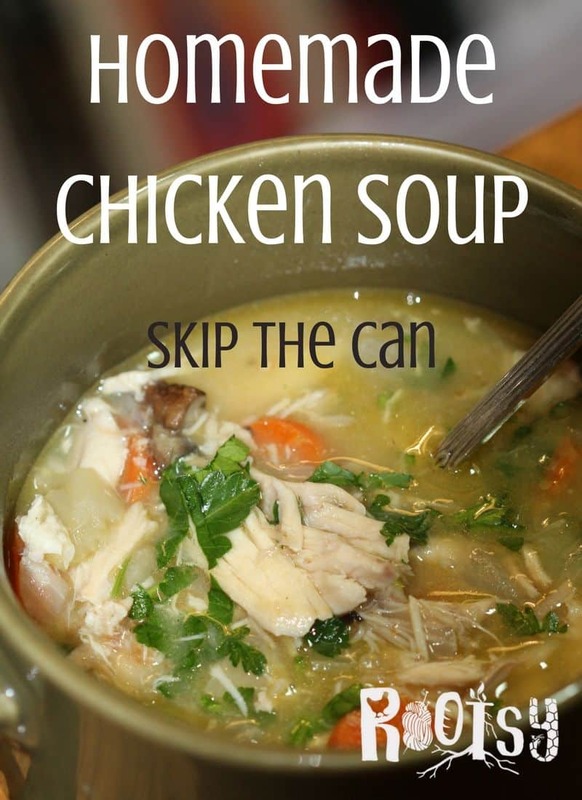 So as one chicken soup lover to another, let me tell you… back away from the can. You’ve got this. You can make chicken soup yourself. Best part? No more hunting for those itty bitty pieces of chicken, you can load up your homemade version with generous pieces. Soothing homemade chicken soup delights the taste buds and helps get rid of the hitch in your giddyup (purely my opinion). But don’t worry if you haven’t made chicken soup before. 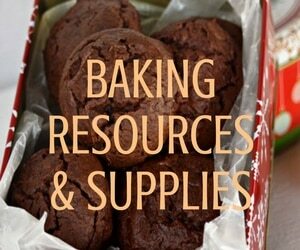 All you need are fresh ingredients, a little time, and a recipe to follow. Now while there are a thousand different ways to make homemade chicken soup (every grandma had her own secret or special ingredient), there is truly no wrong way to make it. What I present to you is simply my favorite method of preparing this childhood (and adulthood) favorite. This recipe can be made with fresh chicken, but will also be quite tasty if you only have access to frozen chicken. To begin, thaw your chicken (if using frozen). And don’t forget to remove the package of giblets if using a store-bought chicken. Melt butter or lard in a dutch oven (large enough for the chicken) over medium heat. stuff the chicken cavity with lemon slices and a handful of fresh parsley sprigs. Generously salt and pepper the exterior of the chicken. Place chicken on top of sliced potatoes, breast side up. (Save giblets for another meal). Pour in water to cover the potatoes by 1 1/2″. Place the dutch oven inside an oven preheated to 450F. Set timer for 1 hour. After roasting for 1 hour, remove the lid and drop the oven temperature to 400F. Roast for an additional 15 – 20 minutes to crisp the skin. Also, check the temperature of the bird with a meat thermometer. The chicken is done when the temperature reaches 165F. 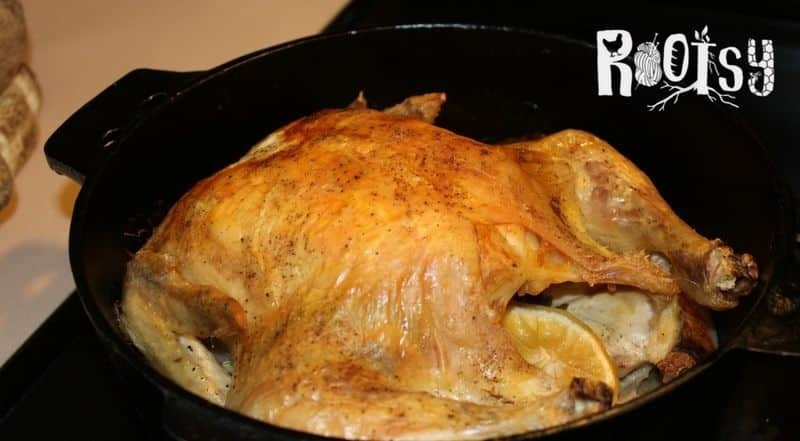 Place roasted chicken on a platter and allow to rest for 15 minutes. 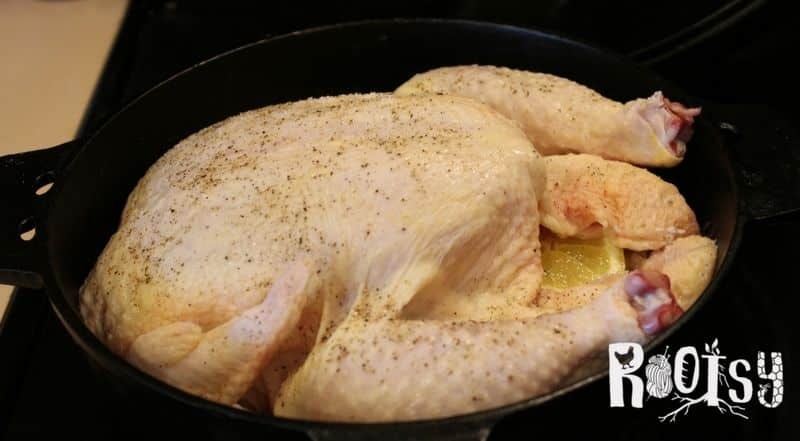 With your hands, pick the chicken meat from the bones and place the meat in a separate container. Also, reserve the chicken skin that did not get crisp (from the back and underside of thighs) and add to the bones. Novice hint #1: save the reserved skin and bones to make chicken stock. Roasted chicken adds a wonderful flavor for the pending soup, but if you don’t have the time, you can simply sauté the meat in a skillet. Novice hint #2: the potatoes keep the chicken off the bottom of the dutch oven and out of the resulting melted chicken fat. These potatoes do not go in the soup but are delicious eaten on their own as they absorb all the chickeny goodness during the roasting process. Novice hint #3: pour off the liquid and save. As the liquid cools, the solid top layer is chicken fat. Keep it! Don’t throw it away. You can use it to flavor roasted vegetables, slather onto freshly baked bread, or as a fat when sautéing vegetables. Novice hint #4: Use the reserved liquid (below the chicken fat) as a simple chicken stock. (My mom called this chicken water as it really wasn’t chicken stock, but it does have a chicken flavor). This is great to add to soups or stews. Place a large stock pot over medium heat. Add olive oil and butter. Once the butter melts and begins to sizzle, add the onions, carrots, celery, and mushrooms. Stir so keep the vegetables from sticking to the bottom of the pan. Once the onions are translucent, add the garlic, bay leaves, salt, and pepper. Next, stir the flour into the vegetables until they are thoroughly coated. Immediately add the chicken stock and stir to combine everything. Reduce the heat to a simmer and cover the pot with a lid. Simmer for 30 – 45 minutes, stirring periodically. NOTE: the flour will give a slight thickness (or body) to the soup. Taste for seasoning. If needed, add a little more salt. Lastly, remove soup from heat, pick out the bay leaves, and sprinkle the parsley over the top of the soup. Serve immediately and enjoy those big chunks of chicken (no hunting for itty bitty pieces in this creation). So soup lovers, you have it in you to step away from the can. 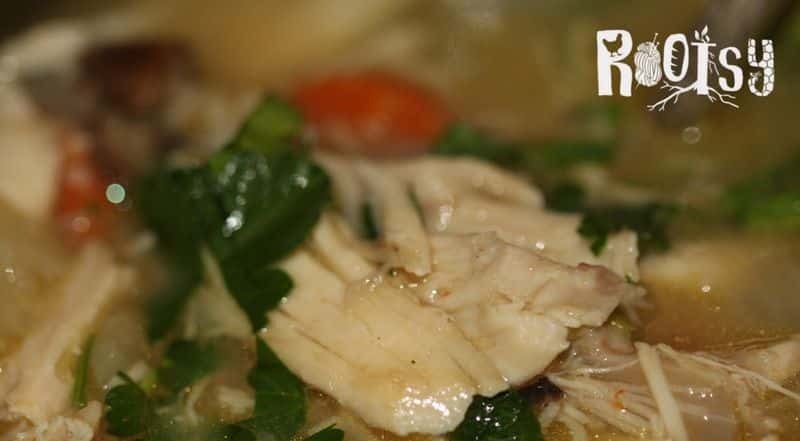 Tasty, homemade chicken soup is within your culinary abilities. 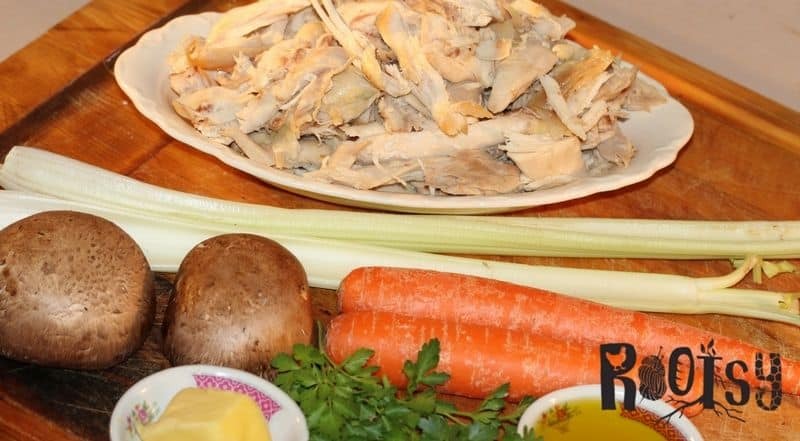 Are you ready to make homemade chicken soup for you and your family? Click here to see more recipes.